﻿Friday 1st June. A fourteen hour bus ride. 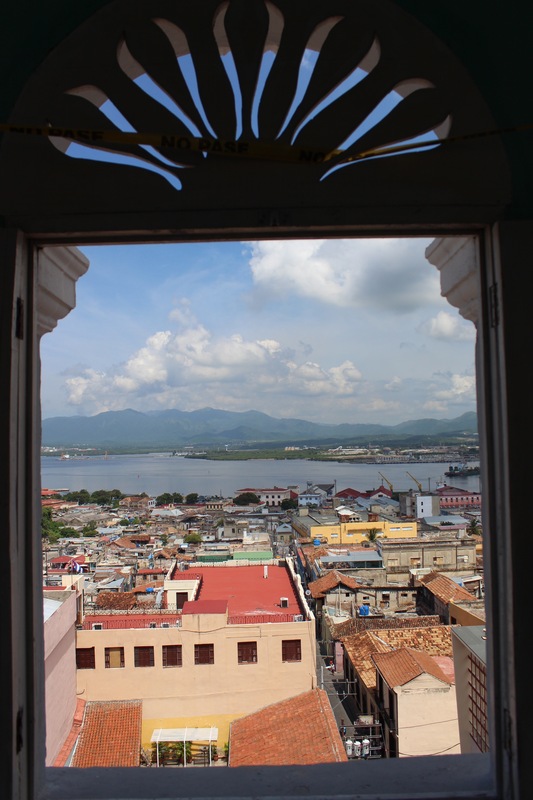 450kms further south east is Santiago de Cuba. 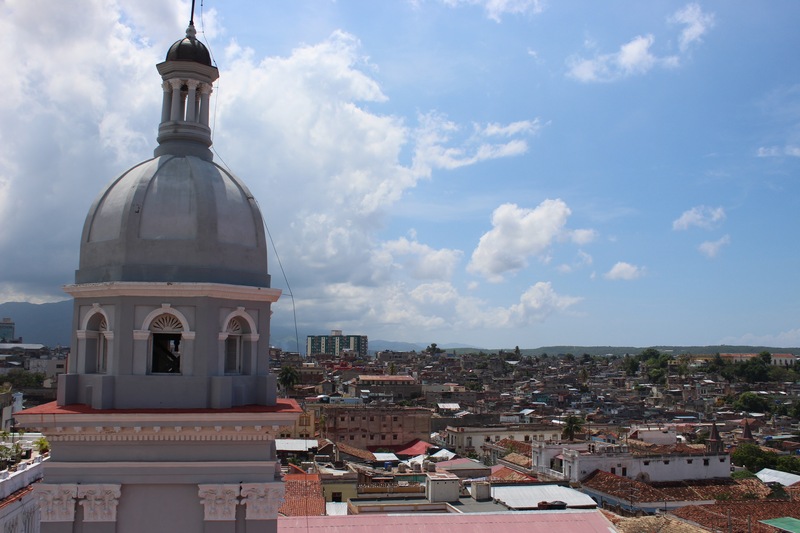 Truly a world away from Havana, this modern city, the original capital is one long bus journey away. If we felt we were lacking revolution fever before, we were about to get a big dose of it. ‘Hasta la Victoria Siempre’ followed us on every sign, immortalised with Che’s stern face. This was the city of Fidel Castro’s failed putsch on the Moncada barracks in 1953 which with revolutionary fervour is celebrated as the beginning of the journey for Cuba. Interestingly we noted, we were the next state over from Guantanamo, so we spent a large portion of the journey spying on the roads and structures in the bay. The day before we moved on to the next town I had taken to calling ahead the next casa, either a recommendation or a lonely planet listing, on the landline. 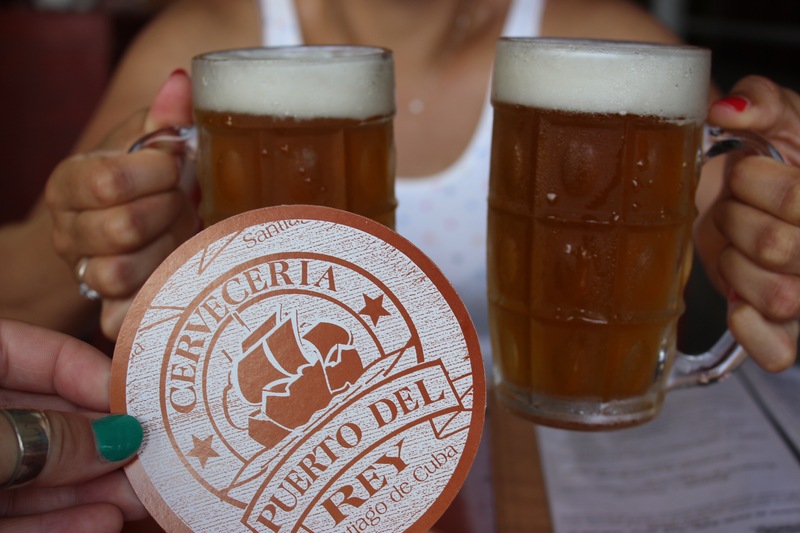 You never knew what you were going to get, a bubbly welcome or a stiff mix of Spanglish. Our stay in the home of Nelson and Deysi was organised entirely in Spanish, and without the cues of face to face contact, these conversations are something I’m pretty proud of. I made sure to tell them how and when we were arriving, one room with two beds and our names. I confirmed the address and we discussed that it was a short taxi ride from the bus station to the door. Still, the conversations are far from perfect and it was a lovely surprise that a taxi was waiting for us in the pushy crowd that welcomed us to Santiago at nearly 10pm at night, 14 hours after boarding at 8am that morning. Their home was an oasis of comfort, flushing toilets, air con and drinkable coffee for breakfast. Someone had turned the heat up in Santiago and we were going to melt. This was the south and felt vastly different from any other town. Tall town houses extended in blocks and the city was vast and in part, modern. Emerging into the day we noticed more traffic, motorbikes honking as they passed each intersection, more cat calling and attention but most importantly, our first Cuban supermarket. We just haven’t seen a single one. Not something to write home about, the aisles were dark and the produce tacky. 1.5 litres of Havana Club rum was selling for 6 CUC/USD yet a bottle of Gatorade was 3. There was a whole aisle of Tupperware yet two varieties of biscuits. A fair whack of cereal, some meats and the cheese we had come to dread. Still, notable. In these first few moments we also met our dog companion that we named Jeremy. With half of his left ear bitten, he took to being our guard/guide. From that first square we emerged onto a pedestrianised shopping street that was heading down at a steep incline to the waters edge. Colours and sounds were everywhere but in a different feel to the other places. There was adverts shown on TVs and neon lights, brightly coloured clothes had slogans. We admired hair dyed reds and greens and even a girl sporting blue lipstick. We were pulled off the main street by a blue building which caught our attention. It turned out to be the Cathedral which was light blue Neoclassical style with white detailing, as if frosting on a cake. A quick glance inside showed more blue intricate designs, but I was quickly shown out for wearing shorts and directed up the viewing tower to a spectacular viewpoint. 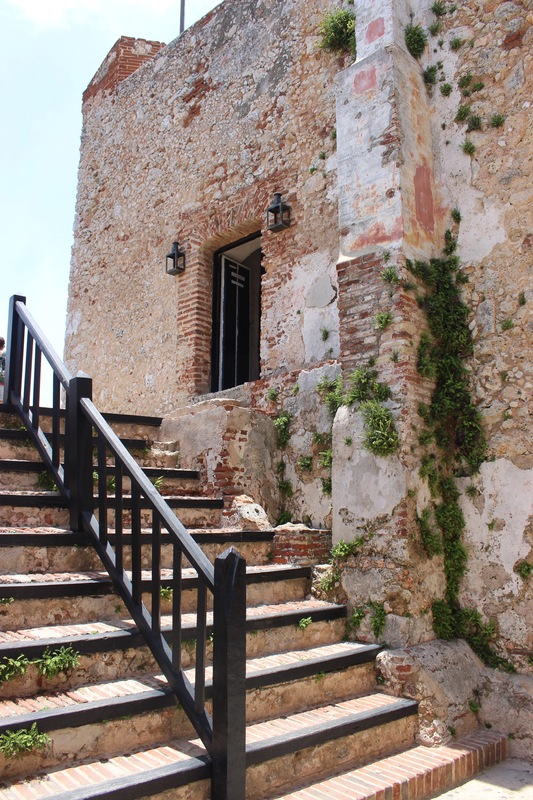 The steeply ascending stairs led to a panoramic view, port ahead, city sprawling all around and a fortress at the mouth of the bay, the Castillo de Morro. With our bearings tapped in we made our way to the water, calling in at markets and pet shops along the way. Here, on the waterside, the streets widened out to accommodate modern buses and archaic army trucks, bike taxis and mopeds, all side by side. The waterfront also had a brewery. Part modern and shiny, part blocky, ugly warehouse, we decided to try the Cuban beer, and in the heat of the day it went down easily. Nearing lunchtime we perused the menu. When we explained to the waiter we were Vegetarian he pulled an amused face and proceeded with ‘very good Cuban food, look, roast pork, you can share..’ I guess in logic that means your only half not vegetarian? 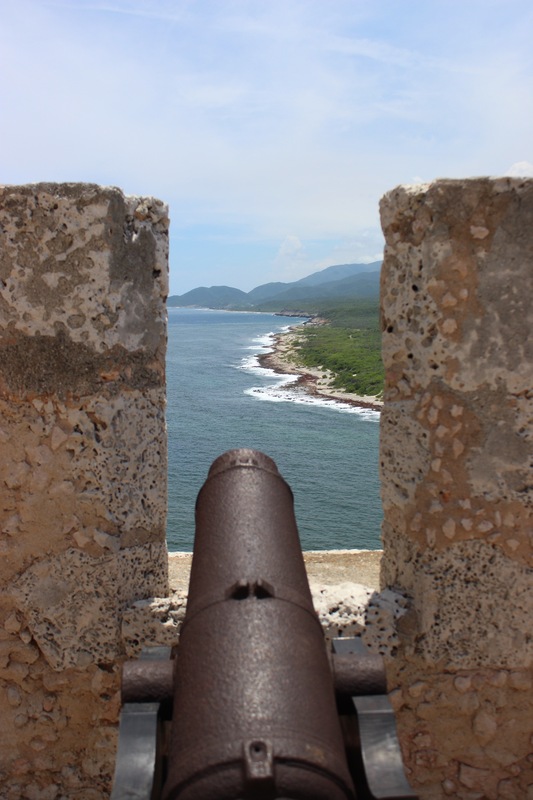 Having glanced the Castillo de Morro from afar, it became our afternoons mission to get out to it. 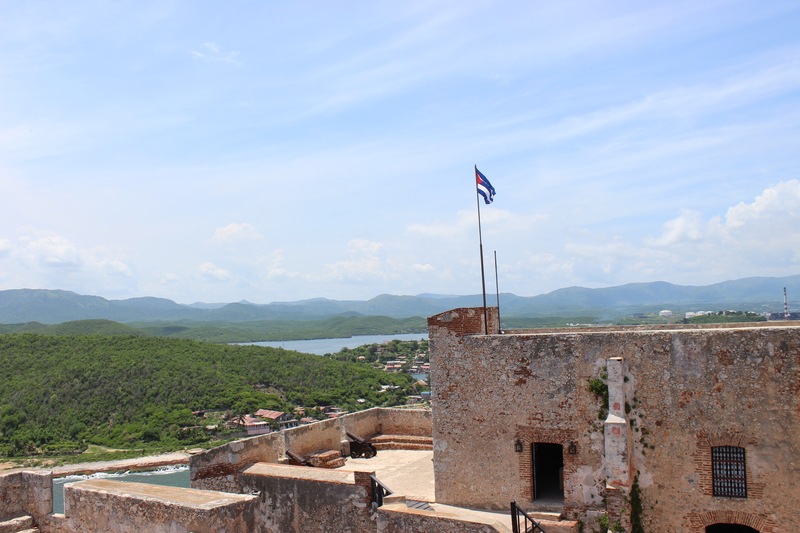 We were later to learn that it was the second fortress in the city and was built in 1638. Our journey there was in a green Chevrolet and through the intersections of the blocks he would honk rather than slow down for traffic which could be weaving in the other directions. Santiago’s harbour has a very narrow mouth and is in parts only 13 metres deep. With the fortress at the end of the bay it was an ideal place to guard this port city, and a beautiful look out point. On the way back to our car we passed the restaurant Paul McCartney visited. Apparently he ate an omelette. 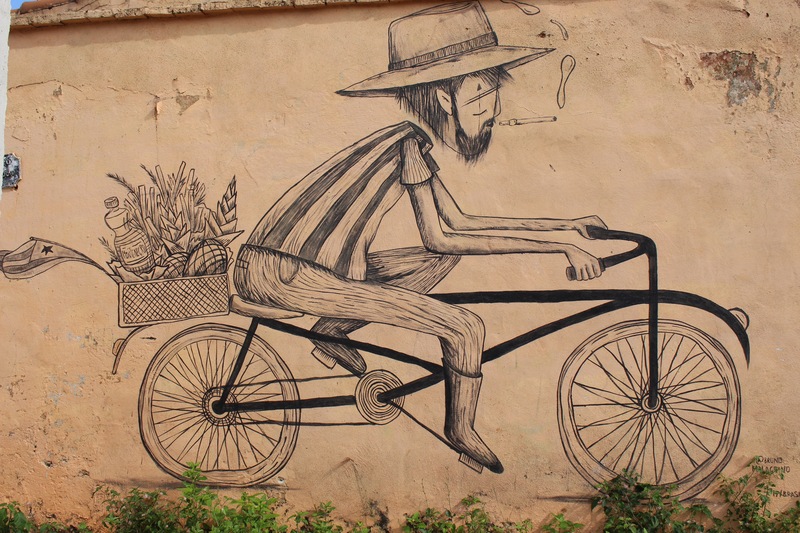 We’ve certainly also felt the struggle of being vegetarian in Cuba. We opted for a coconut and the man heralding a machete and a toothy grin let me wear his coconut hat and pose for a photo. We retired until evening then stepped out to Roy’s Terrace for dinner. It was recommended as a restaurant so we were surprised to see a residential house with a sign outside and rang the doorbell. We were welcomed in to a living room and from a simple set menu we selected ‘vegetarian’ then were told to return in half an hour. Nearby the Padre Pico steps extend down into the Tivoli settlement. They welcomed the sick to a hospital founded by Padre Pico at the top of the hill but now are everyone’s living room. People were gathered together, alone, chatting, playing football, exchanging gossip as the heat of the day began to ebb away. When we returned, our soon to be waiter was napping in the armchair. He was quickly awoken by his mother to show us to the roof where a view of Santiago’s port and skyline welcomed us. As we nursed some cocktails the food began to come. Seven plates of vegetarian dishes in a beautiful setting. 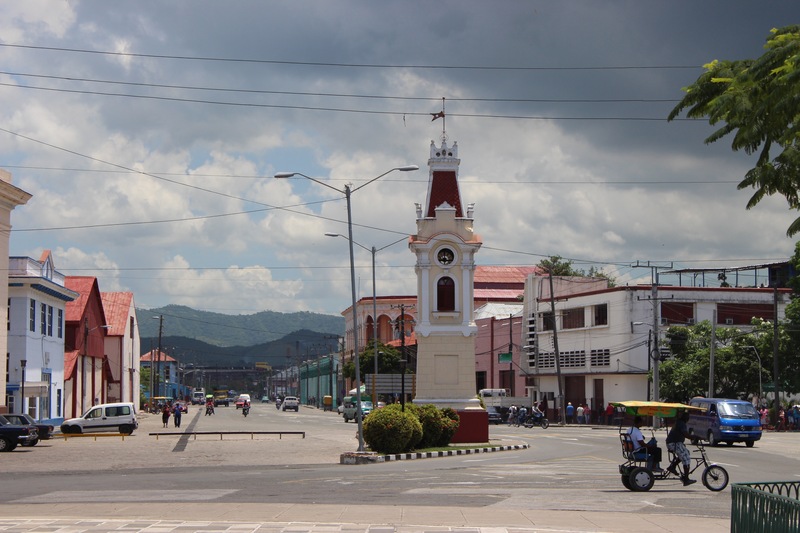 The city was founded in 1515 by the Spanish after Christopher Columbus encouraged Spanish investment insisting there would be much gold to be found. The native people of the land were completely wiped out and a slave owning era began. The mix in heritage here is added to by French Haitians fleeing Haiti with their slaves. They brought with them coffee and whilst relegated to the hills, began plantations. Starting early in the morning we were going to be shown the city by a guide, Alex. He was king of the dramatic pause and well versed to answer every question we had been collecting through our travels. A lot of the information we have been absorbing has been building like layers in understanding this country, also testing the water with what we are able to ask and how to articulate what we wanted to understand. It’s a world away from what we know. He pointed out buildings marking each period Cuba identifies, from being a Spanish colony and fighting a war of independence which culminated in 1898, resisting the American influence and eventually overthrowing President Batista in 1959, an event Santiago feels especially connected to. Two American cinemas from the 1920’s sit on the pedestrianised Enramadas street. Like a lot of the grander buildings, one has sat empty since 1960 when the new government of Fidel Castro seized businesses driving many out of the country with their goods and deeds, leaving shells of buildings to fall into disrepair. In the recent years many have received investment and as we walked the streets, change was happening all around us as restorations continued to take place, but foreign investment isn’t simple. Leases prevent foreigners from having a majority in the profit, often capped at 49%. As well as this they often have a 20 year span, leaving contracts open to expiration and review down the line. As well as history, the conversation explored daily life. Freedom of religion has always been a right here and seems to be continuing to grow in freedom of expression. Whilst Catholicism is the official religion, mixed cultures have led to patchworks of beliefs and a large element of Santeria is still visible, itself having many different strands. Witch doctors practice ceremonies with believers, the evidence of offerings Alex pointed out on particular trees in the city. 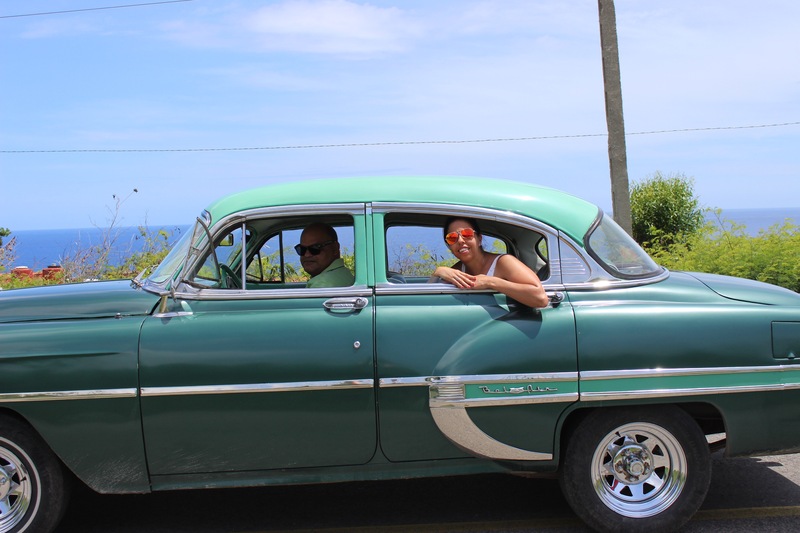 In the afternoon, our Chevrolet chauffeur took us to the beach at Buey Cabón. Due to the lack of cars, transport is pretty costly, but it’s like rolling up everywhere as if you’re going to prom. Being Sunday, lots of local families were at the beach, having big cook ups, hanging out under the wooden umbrellas. We watched a man who had indulged in too many rums fall backwards off his bench and not really register he was now lying in the sand. The water was bath temperature, much warmer even than Trinidad in the centre of the country, so even splashing around in the water didn’t cool you off from the intense heat. Being a natural cove, the water was shallow and calm with a few small fish. I kept seeing this strange fuzzy fish in the water, but after closer investigation I realised it was the well devoured inside of a mango that lots of people were eating whole whilst standing in the water. It was picturesque with big hills following the coastline. Dense greenery went all the way to the water and alongside the dogs and chickens, pigs grazed the fruit scraps too. 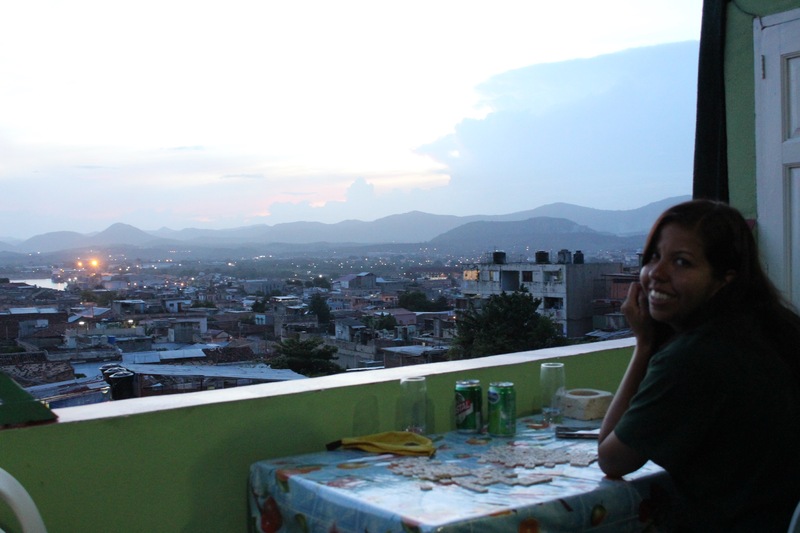 Tired from the day, we ate dinner on the roof terrace of our casa. It seems a lot of life is elevated here, an easy vantage to look out on playing in the streets below. It’s odd to see cats and roosters on the roofs, dogs on balconies seemingly confused while motorbikes pass by below. We had been invited by our earlier tour guide to experience some music that evening and he showed us a bar, so tucked away it was reminiscent of a speakeasy. In the back room music played and although we never got to dancing, the music videos and reggaeton that Alex shook his head was fascinating. In our second history lesson Alex took us along the waterfront to the city’s cemetery, Santa Ifegenia. 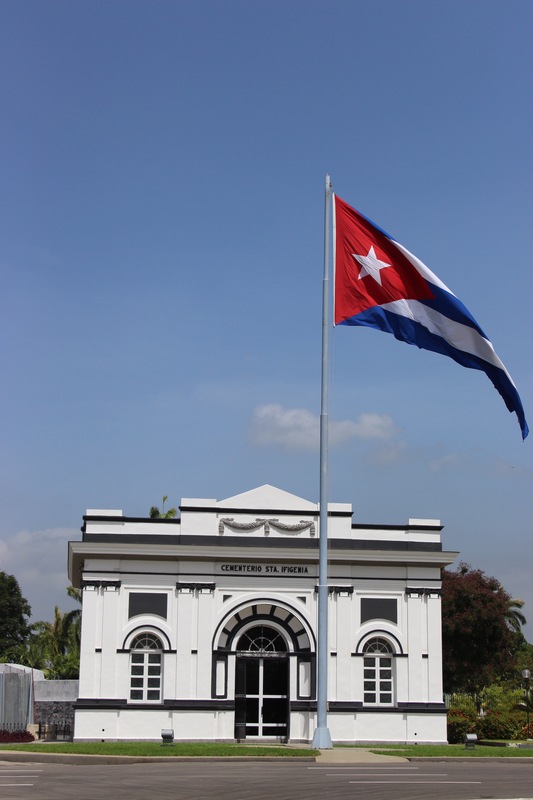 On the way is the factory of the Santiago de Cuba rum using the methods and original materials from Bacardi who were one of the families to flee post revolution. Here rum has continued being produced and the locals feel it is the true Bacardi with the authentic procedure of ageing white oak barrels. 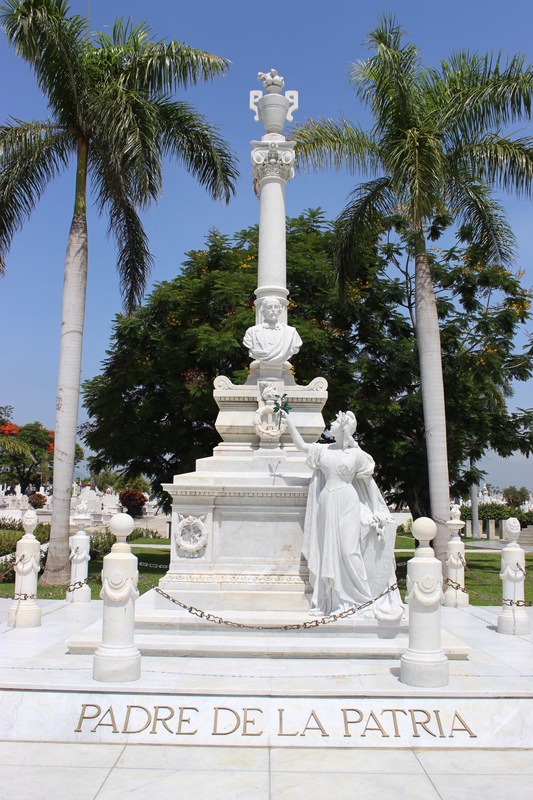 Further along, adorned in marble and granite, the city’s cemetery it is a beautiful site to behold with many important figures. 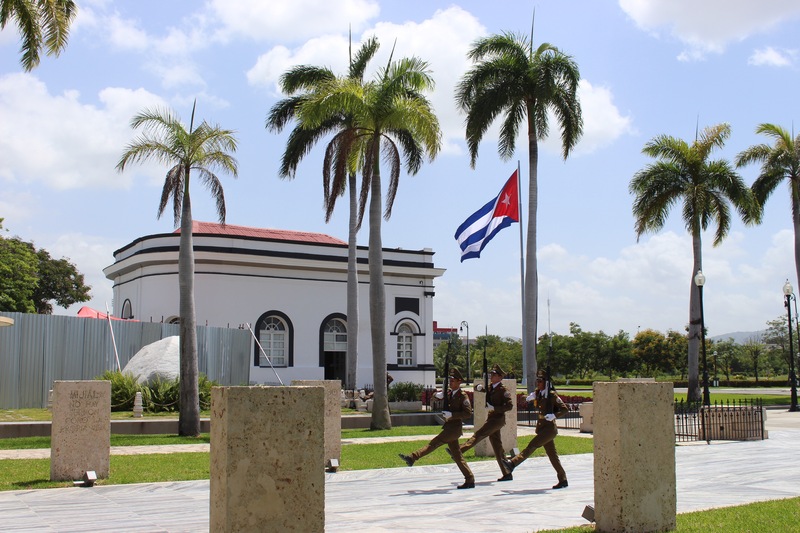 The main mausoleum has the coffin of Jose Marti, the countries idolised revolutionary, poet and thinker. He is not buried which he associated with being a traitor, but asked to face the sun, so his mausoleum is open to the elements. Father of the nation is said to be Carlos Manuel de Céspedes who was crucial in bringing the first war of independence against the Spanish, freeing his slaves as a declaration. He earned the title as the Spanish captured his son and threatened to kill him if he didn’t give up the fight, to which Cespedes answered that everyone fighting for independence was his son. Fidel is also buried here. 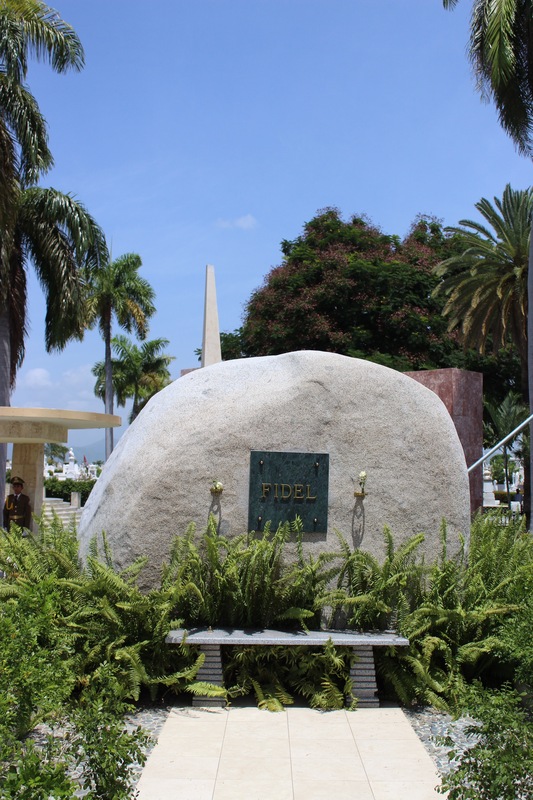 He asked for a simple burial and has a very beautiful two tonne granite rock encasing his ashes with a simple stone marked ‘Fidel.’ The country was in 9 days of mourning following his death. Every 30minutes a dramatic changing of the guard took place. Young soldiers marched in time to rousing music to change post and stand in the hot sun. 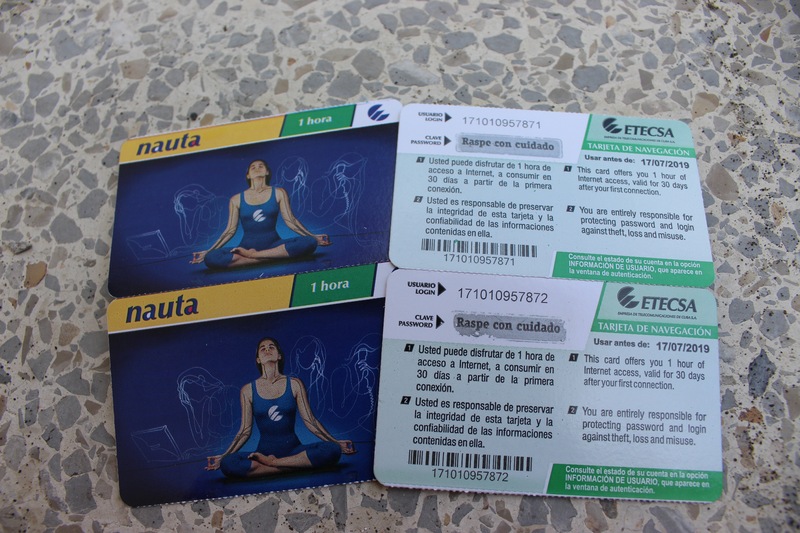 Occasionally we endured the line outside the ETECSA shop which had a one in, one out policy to buy wifi cards and sit in the public spaces using it. Not fast enough to really load web pages, it was more a means to pick up messages and an hour often passed quickly. Whilst you were absorbed in your portal to the outside world you were surrounded by people who were reading the newspapers or dancing together. People came up to us to show us the front page of the newspaper which had a picture of Donald Trump on it. 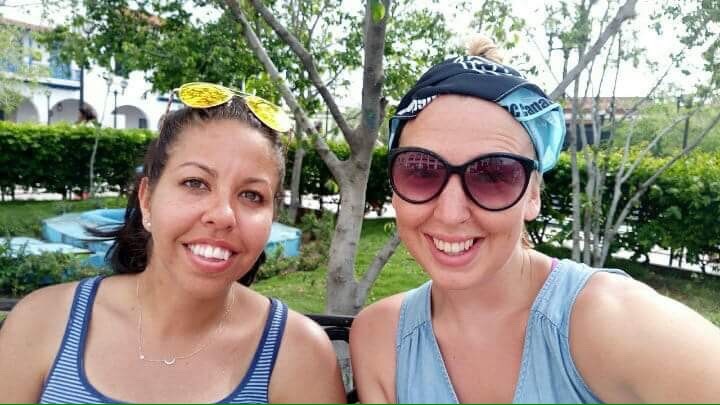 Others asked where we were from, came to compare skin colours and one even exclaimed “white people are beautiful.” With such influence from Africa as well as Haiti in the eastern part of Cuba, we stood out more. We stood no chance of blending in and by now had just accepted the friendly if not tiring attention we were getting. At one point Monique exclaimed in frustration ‘Can I not even step outside without being told I’m beautiful? !’ But as ridiculous as it sounds, it was cat calling, whistling and fascination which is an odd combination when you are sweating from every pore. Alex had introduced us to his friend, a dance teacher, who was going to give us Salsa lessons in his living room. The house was on our street with terraces inside and dark wood interior. His English matched our Spanish but his demonstrations and animated faces made for a mutually understanding and a funny lesson. He taught us the basic steps then examined from 360 degrees for perfect timing before putting on music with a strong beat and calling out the numbers of the different steps he wanted. Before the end of the hour we were taking it in turns to dance with him, being led into the different basic steps, and booked a lesson for the next day. It was things like this that set our experiences apart. 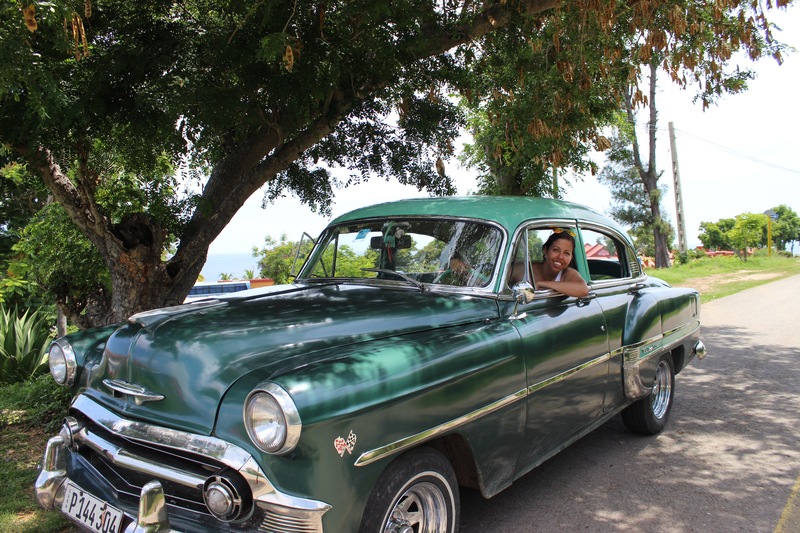 Although Cuba isn’t cheap, we were having private lessons, mostly in Spanish, in someone’s living room, thanks to someone we could now call a friend. Another excursion for the list, again thanks to a friend of Alex was Scuba diving. He had called Richard who had met us at a courtyard coffee shop to discuss our day out. Far from commercialised, we discussed the dive sites and he organised the trip, a truck to transport us and the stuff and he and I would buddy up for two dives the next day. The stops were secluded bays, a little way east of the city. I was to dive in shorts and a t shirt and as soon as we were in the water I could feel why. The waves were big as we swam out to beyond a peninsula where two fisherman were fishing off the rocks. When Richard gave the go ahead we went down to a rocky reef where we could swim between towering rocks. The calm world underneath was far different from the crashing waves of the surface. The second dive site was one of many sunken ships from the war with the Spanish, now a part of Cuba’s history. The beach was strewn with piles of red shreds of seaweed, or as they liked to call it, Cuban snow. Two cannons were poking out from the water marking the spot. It was teeming with colourful fish life. In the truck on the way back, Alex and Richard jumped out to buy rolls from a wooden shack on the side of the road, Cuban fast food. It got us talking about McDonald’s, something they said was suggested when Obama began relations with Cuba that they would have a branch in Cuba by 2018. They were excited, much to our protests, about the idea. 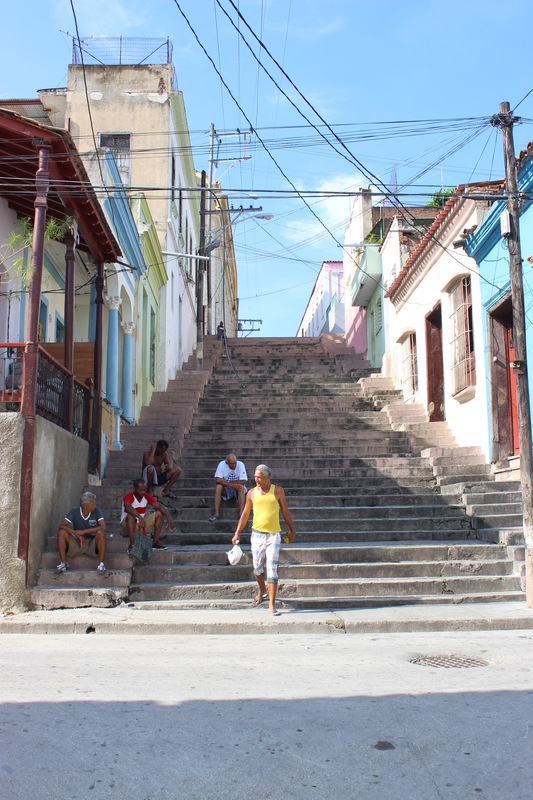 From the outside its very easy to want Cuba to remain a living museum, it’s charm in its isolation, but here talking to real people, it’s a struggle to know how to feel. These intelligent people with a huge thirst for knowledge, bemused by the idea of a kindle and how books are inside it. That being said, it’s clear that the changes of the last few years have a big impact on society. The wage is around 25 CUC/USD per month but now private enterprise and entrepreneurship turns that on its head and allows some to earn vastly beyond that disrupting a once more equal society. We had lunch at one of our safe places as we were becoming so picky with the limited options, the rooftop of the Casa Grande hotel. The building sits adjacent to the cathedral in the Parque Cespedes, one of the elder buildings in the city and the view takes in the whole port and the busy happenings of the city below. Each time we walked to this square we would pass a barbers shop where the old barbers at on the step with his scissors. Each time without fail he would offer me a haircut and snip his scissors together which never failed to raise a laugh. By early evening it was time for our second salsa lesson. This time we added more intricate moves, spins, circling and swapping sides. It was fun to learn individually then we would each dance a whole song with the teacher, him leading and occasionally warning ‘be careful…’ as a foot moved too soon or too far. We took our search for dinner further afield into a more modern looking part of town. Here the grand frontages were on wider avenues rather than the grid structure of the older town. In parks, people enjoyed the cooler part of the day by socialising outside long into the night. 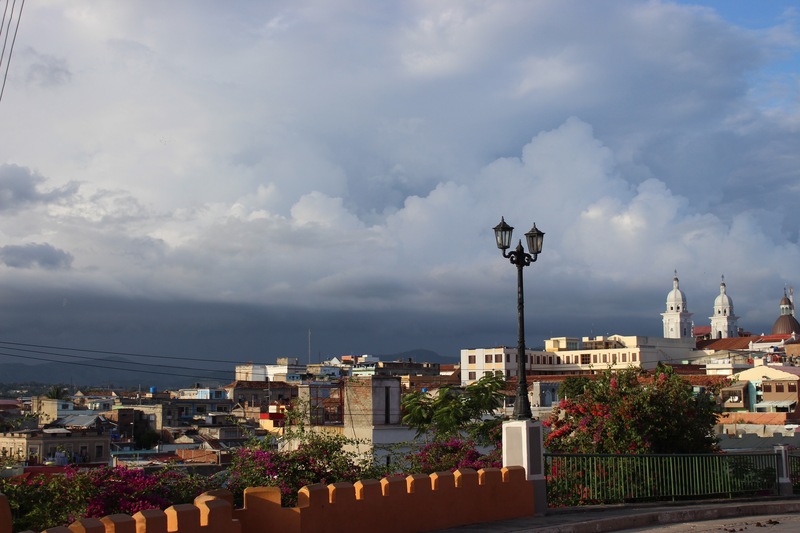 The main reason this city calls itself the Revolutionary city is because Fidel Castro used the mountains surrounding the city he called home to lead groups of revolutionaries. 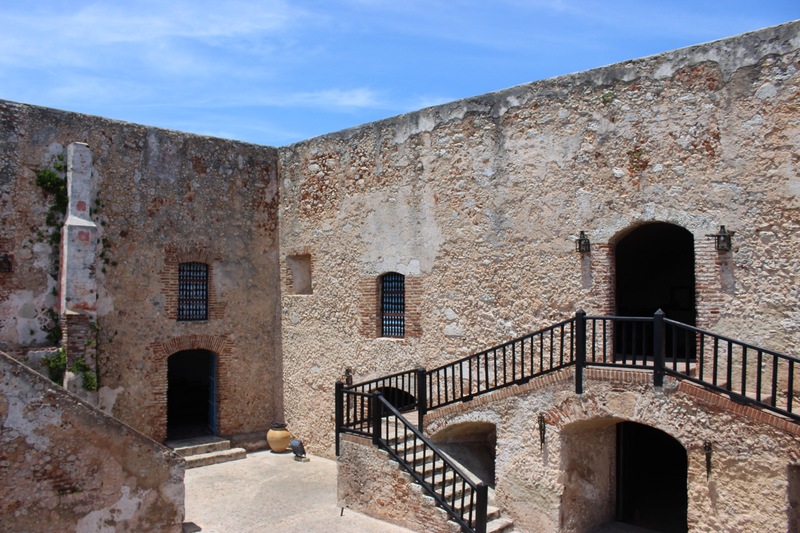 The Moncada barracks in the centre of the city was the site of what is now identified as the first step in the revolution. 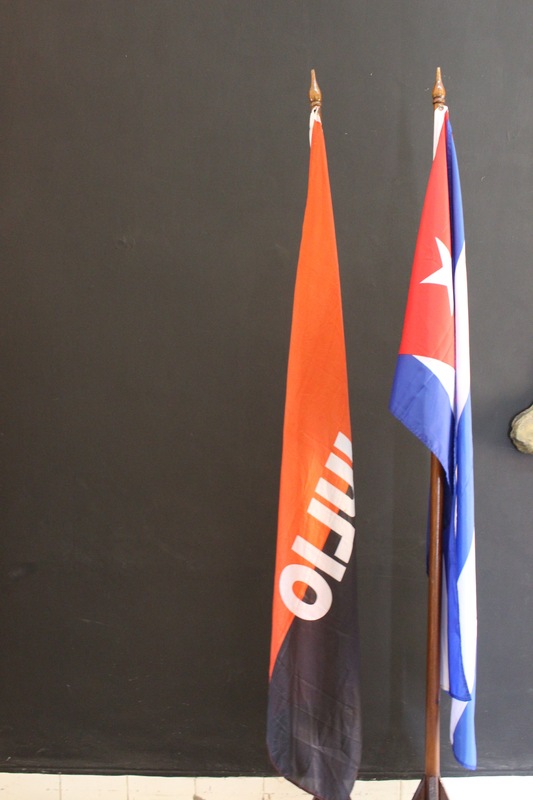 Fidel attempted to seize ammunition at the Moncada barracks on the 26th July. The carnival used to run from the 22nd-24th July and so the aftermath would have been a sleepy time of recovery, an opportune moment? The alarm was raised before the group of student revolutionaries got inside and several people lost their lives either during the attack or in the aftermath. Fidel faced death, however was pardoned as a PR stunt by President Batista during the 1956 elections as he deemed him no longer a threat. Fidel left for Mexico, but would return to absolve himself and continue what he began. Our final thing in this interesting city was to visit the barracks. They are smartly presented in terracotta and red colouring and now hold a large school. With the benefit of hindsight, the revolutionaries are memorialised for a brave act in building a very different future for Cuba. 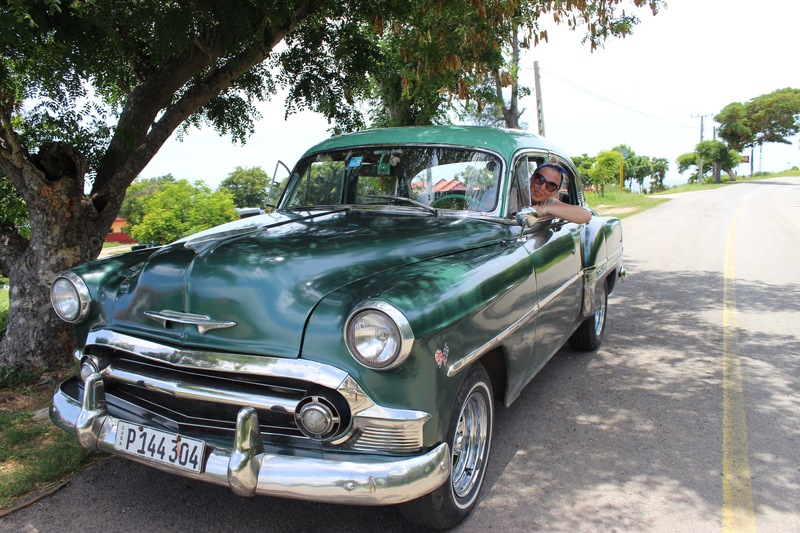 Our afternoon was to spent beginning our journey back to Havana, back to where the trip began, and it was going to be a long one!